226 Beacon is located on the north side of Beacon, between Clarendon and Dartmouth, with 222-224 Beacon to the east and 228 Beacon to the west. 226 Beacon was built ca. 1864 for dry goods merchant and cotton broker George Phineas Upham, one of two contiguous houses (226-228 Beacon) designed as a symmetrical pair. He and his wife, Sarah (Sprague) Upham, lived at 122 Beacon. 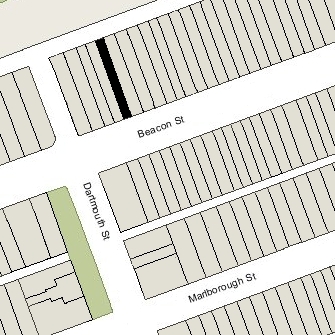 George Upham purchased the land for 226-228 Beacon on June 3, 1863, from the Boston and Roxbury Mill Corporation. 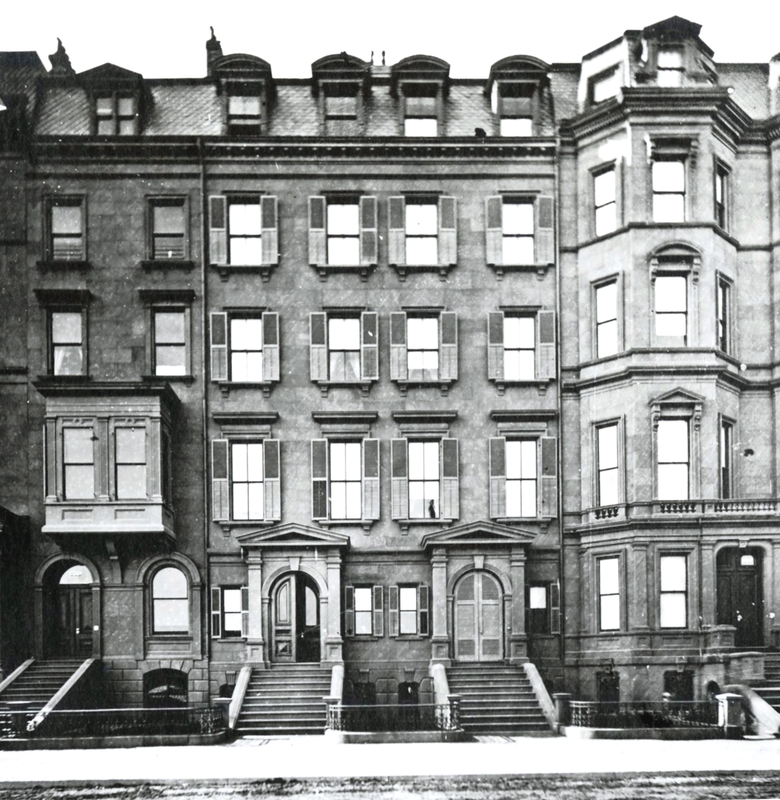 His business partner, William Warren Tucker, purchased the land for 230 Beacon on the same day. Click here for an index to the deeds for 226 Beacon. By 1865, 226 Beacon was the home of George Upham’s mother, Mary Avery (Baldwin) Upham, the widow of Phineas Upham, who also had been a commission merchant and cotton broker. She previously had lived at 19 Mt. Vernon and before that at 23 Mt. Vernon. 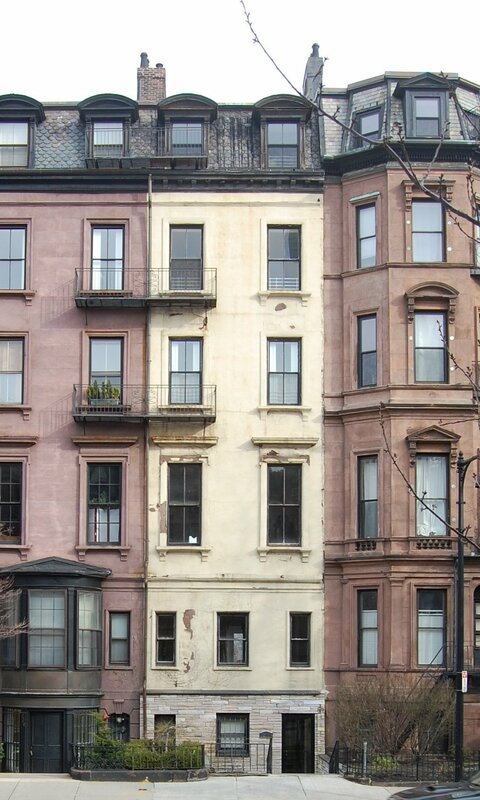 She continued to live at 226 Beacon until her death in May of 1872. On November 23, 1872, 226 Beacon was purchased from George Upham by Marshall Sears Scudder. He and his wife, Rebecca Coit (Blatchford) Scudder, made ot their home. They also maintained a home in Grantville. John Samuel Blatchford, Mrs. Scudder’s first cousin (the son of her uncle, John Blatchford), lived with them. Marshall Scudder was treasurer of the Walworth Manufacturing Company, manufacturers of heating equipment and systems. He died in August of 1875 and Rebecca Scudder moved soon thereafter. On June 24, 1876, 226 Beacon was acquired from Marshall Scudder’s estate by attorney Charles Eustis Hubbard. He was Rebecca (Blatchford) Scudder’s half-brother, their mother, Mary Anne (Coit) Blatchford Hubbard, having married first to Henry Blatchford and then to Samuel Hubbard. Charles Eustis Hubbard and his wife, Caroline Dennie (Tracy) Hubbard, lived at 339 Marlborough. In 1876, 226 Beacon was the Boston home of cotton buyer and dry goods merchant George Wellman Wright and his wife, Georgianna (Buckham) Wright. They had lived at 208 Beacon in 1875, and maintained their primary residence at Pine Hill in Duxbury. On September 23, 1876, 226 Beacon was acquired from Charles Hubbard by Adeline Locke (Clark) Haskell, the wife of wholesale grocer Jacob McGaw Haskell. They previously had lived in Swampscott, where they continued to maintain a home. Jacob Haskell died in November of 1906, and Adeline Haskell continued to live at 226 Beacon with their daughter, Adeline Mayhew Haskell. On March 30, 1907, she transferred the property into both of their names, They also maintained a home in North Beverly. Adeline (Clark) Haskell died in January of 1918. Adeline Mayhew Haskell continued to live at 226 Beacon and in North Beverly. In May of 1930, she applied for (and subsequently received) permission to convert the stables at the rear of the property into a garage. 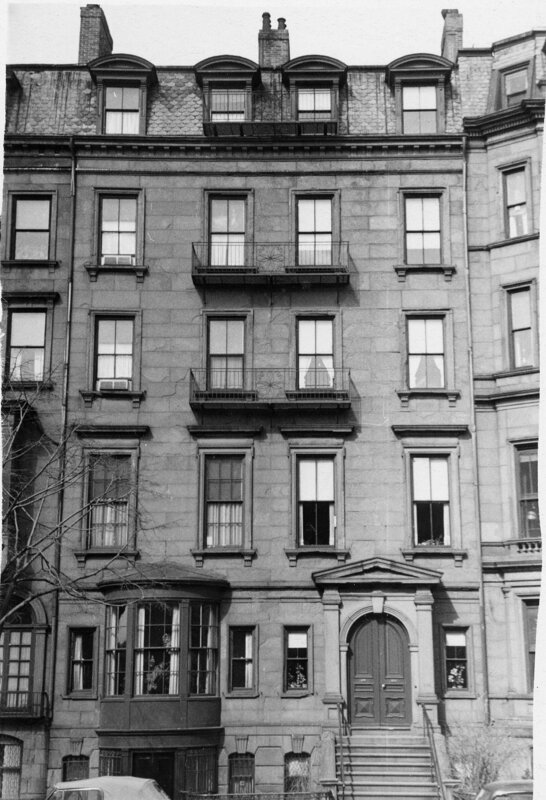 Adeline Haskell continued to live at 226 Beacon until her death in September of 1944. She died intestate and her estate, including 226 Beacon, was inherited by her niece and nephew, Helen Hall (Haskell) Freeman, the widow of Harold Heald Freeman, and Edmund Ralph Haskell. They were the children of Adeline Mayhew Haskell’s brother, Edmund Mayhew Haskell and his wife, Serena R. (Harkins) Haskell. On December 13, 1944, Edmund Ralph Haskell and his wife, Helen (Glancy) Haskell, acquired his sister’s interest in 226 Beacon and made it their home. They also maintained a home in Ipswich. He was a civil engineer. They continued to live there until about 1961. On June 13, 1962, 226 Beacon was acquired from the Haskells by John H. Ayvazian, Jr., Nubar J. Dinjian, and George Najarian, trustees of the Penwood Realty Trust.. In October of 1962, they filed for (and subsequently received) permission to convert the property into eight apartments, including lowering the front entrance to street level. The remodeling was designed by architect Leon L. Furr. In April of 1963, it amended the plans to add construction of a one story heater house at the rear of the property, replacing the former garage, which had been torn down. On April 7, 1969, the Penwood Realty Trust transferred 226 Beacon to Nubar Dinjian’s wife, Marguerite (Moranian) Dinjian. On April 10, 1969, she entered into an agreement with Snelling Robinson Brainard and David V. Harkins, trustees of the Beacon Street Improvement Trust, granting them an option to purchase 226 Beacon on or before February 16, 1970. They owned 228-230-232 Beacon and held an option to purchase 234 Beacon. On February 21, 1973, 226 Beacon was acquired from Marguerite Dinjian by Betty Bishop, and on February 23, 1973, she converted the property into eight condominium units, the 226 Beacon Street Condominium.